The following piece of a map shows a course leg and some alternate route choices. The best route choice could be the shortest, or flattest, or smoothest or driest, or least prickly or the most certain to find the control easily. It all depends on your skill level and physical ability and personal preference. 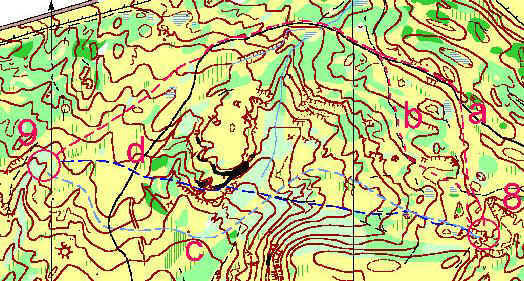 d) shortest route, steeper terrain, and prickly vegetation.